Cleveland was one of two big league teams to have its Minor League affiliates take home two league titles in 2010. The Lake County Captains defeated Clinton in five games to win the Class A Midwest League crown in their first season in the league. Meanwhile, the Columbus Clippers, the Indians' Triple-A affiliate, topped Durham in four games to earn the Governors' Cup. They followed that up by besting Tacoma in the Triple-A National Championship Game. The Indians had one other affiliate reach the playoffs, as the Kinston Indians were swept out of the Carolina League semifinals by Winston-Salem. Catcher -- Chun-Hsiu Chen, Lake County (58 games)/Kinston (52 games): The 21-year-old Chen enjoyed a breakout season, earning Midwest League All-Star and Futures Game honors. He posted an .887 OPS in 58 games with Kinston and boosted that number to .966 in 52 games after being promoted to Lake County. Chen also enjoyed a strong year behind the plate, throwing out 37 percent of base-runners. "He provided a lot of life for us in the middle of the lineup," Kinston manager Aaron Holbert said. "He drove in some runs, he hit a few homers with us, scored some runs. He was a great addition, especially down that stretch run, to fill in the middle of that order. "He has good feet and a good arm, it was huge for us to have a guy like that back there." First baseman -- Wes Hodges, Columbus (125 games): Hodges followed an uneven regular season in which he hit .270 with 15 homers with a superb postseason. He hit .313 with an International League-best three playoff homers and was second to teammate Jerad Head with 10 RBIs. Second baseman -- Jason Kipnis, Kinston (54 games)/Akron (78 games): The Indians' second-round pick in 2009, Kipnis followed up his excellent regular season with a clutch postseason, hitting for the cycle to lead Triple-A Columbus to a championship-clinching Game 4 win. "He started with us, hit right at the .300 mark. He may be short in stature, but knows how to swing the bat -- he has some pop in his bat," Holbert said. "I know he didn't have as many home runs as he would have liked for us, but you saw what he did for Akron and in the Triple-A playoffs. He's a guy that can get on base and steal 10-15 bases for you. He's an offensive-minded guy who can drive in runs and be a run producer." Shortstop -- Casey Frawley, Lake County (129 games): Another playoff hero, Frawley batted .262 with 13 homers for the Captains. 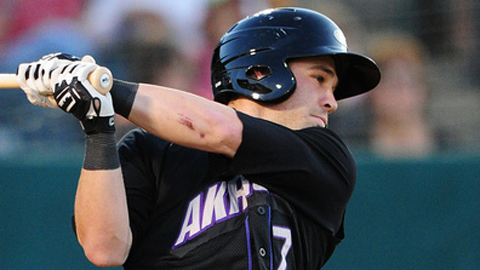 He also led Midwest League shortstops with 74 RBIs. Frawley then hit .326 in 11 playoff games, and drove in the decisive run in Game 5 of the Midwest League Championship Series, leading the Captains to the title in their first season in the league. Frawley also led all Indians Minor Leaguers with nine triples. Third baseman -- Jared Goedert, Akron (44 games)/Columbus (81 games): Goedert paced all Indians Minor Leaguers with 27 homers and was second with 83 RBIs. His .527 slugging percentage in 81 games with the Clippers would have placed him fourth in the International League had he qualified. Left fielder -- Nick Weglarz, Akron (37 games)/Columbus (50 games): Despite seeing his season end in late July due to a right thumb injury, Weglarz rebounded from a rough 2009, raising his average from .227 to .285. He continued to show excellent patience by drawing 50 walks while posting an .893 OPS. Despite only playing 87 games, Weglarz slugged 13 home runs, nearly matching his 2009 total. Center fielder -- Jordan Henry, Kinston (42 games)/Akron (74 games): Henry proved to be trouble for opposing pitchers in 2010. The Indians' seventh-round pick in 2009 combined to hit .312 with the K-Tribe and Aeros, third among Indians Minor Leaguers. Henry also swiped 29 bases in 35 tries and drew 76 walks, while contributing 10 assists in the field. "Henry was great for us. His on-base was over .400 for us [it was .438]. Every time he walks to the plate, he has an opportunity to get on base and score a run for us," Holbert said. "He injured one of his fingers and was out two to three weeks, and we saw the difference in our lineup -- our runs per game went down. "He's a guy that really creates havoc. He doesn't try to do too much. He's up there to try and put the ball in play and take the walk if need be and be that top-of-the-order guy who gets on base and can be a spark for the guys behind to him drive in." Right fielder -- Jose Constanza, Columbus (113 games): The 27-year-old continued to improve, raising his batting average for the fourth straight season and leading the Tribe's Minor Leaguers with a .319 mark. Constanza got better as the season wore on, batting .343 in 45 games in the second half and was named to the International League All-Star Team. He was fourth in the International League with 34 stolen bases, and tied for the lead with eight triples. Designated hitter -- Lonnie Chisenhall, Akron (117 games): Chisenhall led the organization with 84 RBIs and was third with 17 homers, leading to Eastern League All-Star honors for the 22-year-old third baseman. The North Carolina native also represented the United States in the Futures Game, in which he drove in a run. Chisenhall finished the season strong, posting an .870 OPS in 51 games after the All-Star break and drew a career-high 46 walks with the Aeros. Left-handed starting pitcher -- Matt Packer, Lake County (24 games)/Akron (six games): Packer spent some time coming out the bullpen, appearing in 12 games as a reliever but made his presence known as a starter. Between Lake County and Akron, the University of Virginia product combined for a 7-5 record and a 2.11 ERA in 18 starts. Overall, Packer's 2.04 ERA led Indians Minor Leaguers, and he was fifth with 123 strikeouts. Right-handed starting pitcher -- Joe Gardner, Lake County (six games)/Kinston (22 games): Gardner, a third-round pick in 2009, led Cleveland's affiliates with 13 wins and 142 strikeouts. He also limited Minor League batters to a .197 average and only allowed six home runs all season. "I would call him an ace," Holbert said. "Joe came up from Lake County with a very good sinker, good changeup and works in a slider as well. His sinker pretty much drops off the table and keeps guys off balance and gets the ground ball that managers love. He's a guy you can count on and give the ball to every fifth day. He was one of those guys that you know is coming up, and you know you have a very good opportunity to win." Relief pitcher -- Cory Burns, Lake County (14 games)/Kinston (40 games): Burns put together a dominating season out of the bullpen, combining for 42 saves and 81 strikeouts in 55 innings between the Captains and K-Tribe. Despite not making his Carolina League debut until May 21, the 2009 eight-rounder led the league with 30 saves and was a postseason All-Star. "He's just very deceptive. He's a little herky-jerky -- he does that turn-his-back-from-the-hitter thing which throws them off," the Kinston manager said of his closer. "He has a fairly good fastball, but his knuckle curve is his go-to pitch. They get fooled by his deceptive delivery and combined with that knuckle-curve, [that] makes for a tough at-bat for opposing hitters."